Perhaps wearing one of his new shirts, or at least wearing a mended one, Oakes Ames traveled to neighboring Canton today. 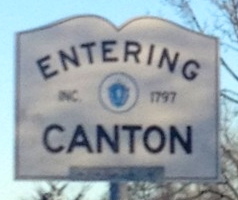 Named for Canton, China, because some imaginative citizen believed the Chinese city to be its geographical twin on the opposite side of the world, the Massachusetts city had manufacturing interests much like Easton. Since before the American Revolution, the Kinsley family had operated an ironworks there. Like the shovel works, the Kinsley business had started small and grown well. Initially, it produced farm implements and was entirely family-run. It had a forge, a large rolling mill and the capability of producing steel. In 1851, Lyman Kinsley was its sole operator; by 1858, the company would be owned by the Ameses. Oliver Ames Jr. would become its first Ames president, with others to follow (Frederick Lothrop Ames would be next, and after him, his son Oliver.) Frank Morton Ames would be its General Manager. Perhaps Oakes’s visit to Canton today, although certainly having something to do with getting steel for shovels, was also quietly prompted by some foreknowledge that the Ameses were interested in acquiring this complementary business. Once the Ames owned it, the Kinsley Iron and Machine Company would eventually develop to produce wheels and axles for railroad cars, another product that would fit nicely with Ames business interests.